~ THE LAZY VEGAN ~ HOME OF PACO & LUIGI AND FRIENDS: Getting Certified at The Lazy Vegan! 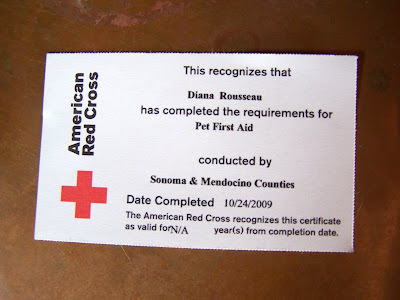 Today I took the Red Cross Animal First Aid course and now I'm certified! It makes me feel much better about being prepared in the event of an emergency around here. 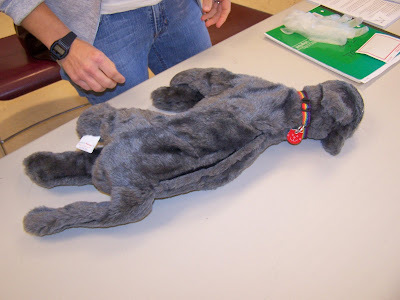 It was a great class with stuffed animals as the dummies, along with a rubberized dog- at times it was hard to suppress the giggles, and this was a serious subject! The class was at the Humane Society and during the break I went to visit the dogs and cats and bunnies. There are even some rats and guinea pigs waiting to be adopted. Of course I want to take them all home! But one rescue bunny is enough for now! Now I'm off to spend some quality time with the donkeys. I actually woke them up for the second morning in a row- they were both laying outside the barn at the entrance. Weegie is always the first to get up while Paco lies there and stretches and yawns. It is one of the cutest sights I've ever seen! I have to take my camera out with me- even though it is dark, I may be able to capture a photo! 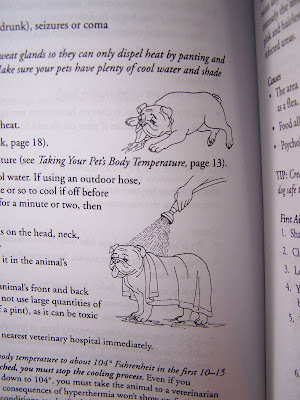 We got a book in the class that is very descriptive and good to have around as a reference book. 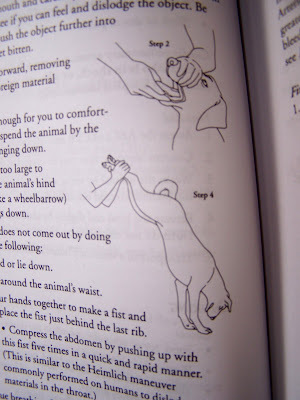 The photo above is one of the choking techniques to use on a dog. 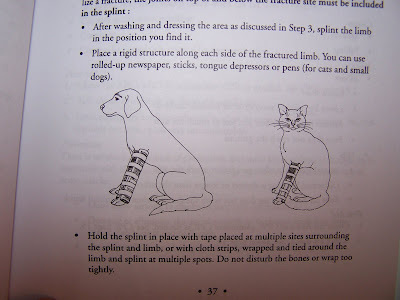 I think it is a little funny that the dog and cat are smiling in the drawings above! I learned A TON of info that I really didn't know. 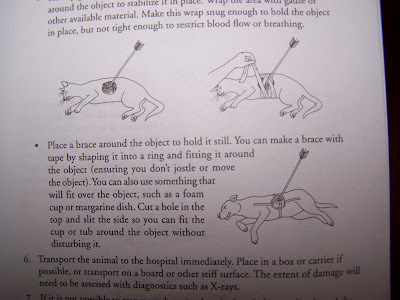 For example, if a foreign object is stuck in your pet, do not remove it- but keep it in and seek treatment. Yikes! 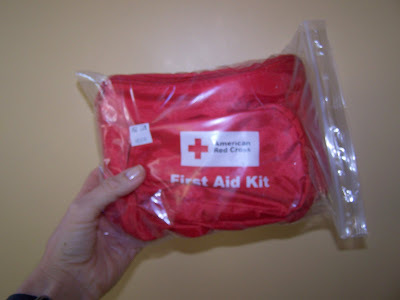 My first aid kit, geared for animals. 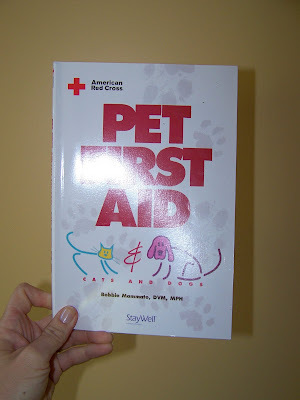 And this nifty book, which only addresses emergencies for cats and dogs. 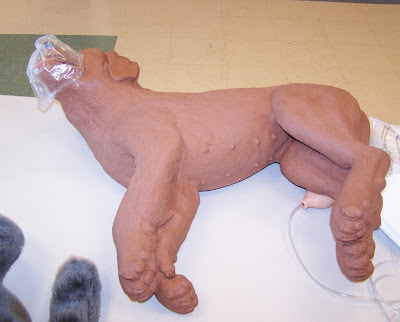 The rubberized dog that had a pulse we had to check! 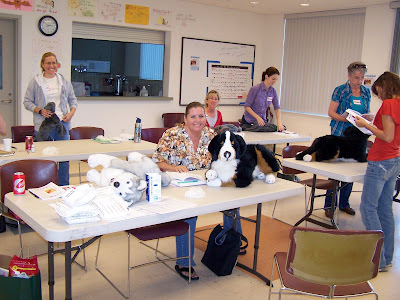 It was a very small class and all women- you could pick a dog or cat to practice on. 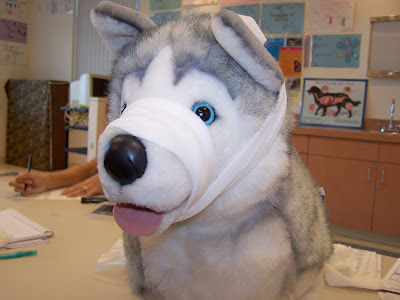 I picked this beautiful husky! Here's my attempt at a muzzle! The cats were kind of large and odd looking. Some of the students were vet tech students getting certified and two students did pet-sitting. 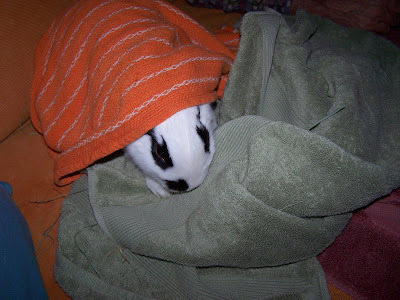 We discovered that Wasabi likes to be wrapped in a towel! 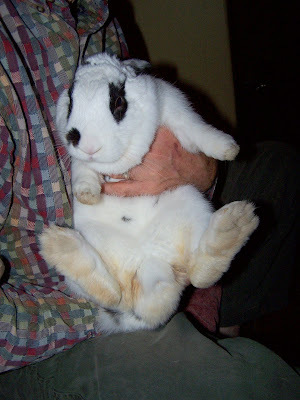 Being held, which she doesn't like but is important to do a couple of times a day (according to one of the bunny books). Look at the size of her back feet! No wonder she can thump! When I take her to the vet to be spayed, I'm going to have them clean up her feet and the rest of her fur that got so dirty from the awful cage she was in. 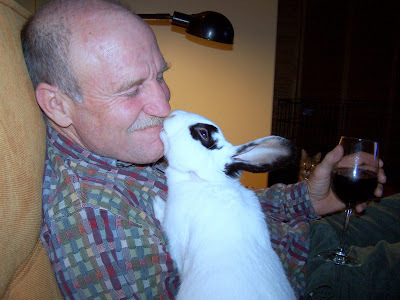 "Wabi" is really settling in and has been doing half-binkies, which is what bunnies do - a little dance- when they're happy!! It is a very funny sight! 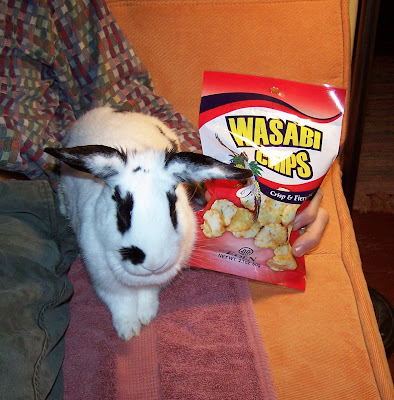 I bought some Wasabi chips for the foreman and of course we had to take a photo with Wasabi!